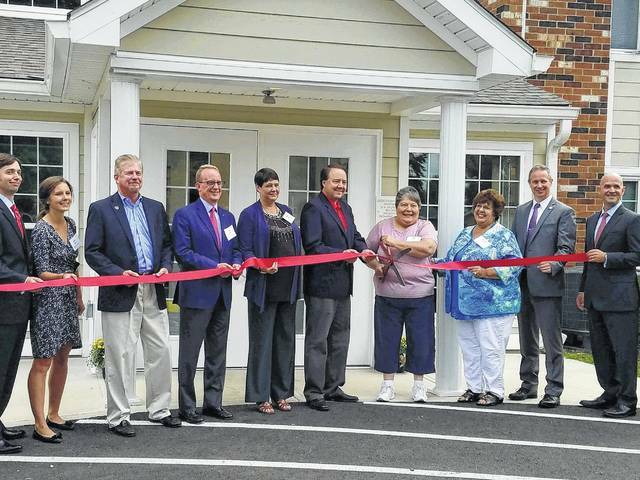 Flanked by U.S. Rep. Pat Tiberi, Wallick Communities’ Tim Swiney and others cut a ceremonial ribbon to mark the grand re-opening of Georgetown Senior Apartments in Delaware today. The community is located at 100 Georgetown Drive. They were joined by Ferzan Ahmed, Delaware County Administrator; Vice Mayor Kent Shafer, City of Delaware; Tom Homan, City Manager, City of Delaware; Alicia Fannon, City Real Estate Advisors; Justin Marshall, Fifth Third Bank; Sean Thomas, Ohio Housing Finance Agency; Rochelle Twinning, Executive Director, BRIDGES Community Action Partnership; and Donna Hyder, Resident, Georgetown Senior Apartments. Georgetown Senior Apartments have undergone a complete $7.4 million rehabilitation using federal Low Income Housing Tax Credits. Originally constructed in 1977, it is a 50-unit apartment community for low-income seniors (age 62 and older) in Delaware. BRIDGES Community Action Partnership and Wallick Communities co-own the community and partnered on the rehabilitation, which was completed earlier this year. The renovated one-bedroom apartment homes have new roofs, updated kitchens and bathrooms with Energy-Star rated appliances and new HVAC systems with programmable thermostats. Outside, there is a new community patio, as well as enhanced exterior lighting and security features. Georgetown Senior Apartments marked its grand re-opening on Tuesday with a ribbon-cutting ceremony in Delaware. From left to right, Justin Marshall, Fifth Third Bank; Alicia Fannon, City Real Estate Advisors; Vice Mayor Kent Shafer, City of Delaware; Tom Homan, City Manager, City of Delaware; Tracie Baldridge, Georgetown Senior Apartments Community Manager; U.S. Rep. Pat Tiberi; Donna Hyder, Georgetown Senior Apartments Resident; Rochelle Twinning, BRIDGES Community Action Partnership; Sean Thomas, Ohio Housing Finance Agency; and Tim Swiney of Wallick Communities.